The robot is called Baxter and seems much of an ideal employee: once you teach him, he gets it. In addition, he is tireless, never gets sick and asks for no holidays or a raise. Connoisseurs of the market see in the friendly looking mechanical employee from Rethink Robotics nothing less than the vanguard of a new robot revolution. Baxter is considered the first robot that for a reasonable price can be deployed side to side with people in a SME production. The simple way in which a task can be ‘taught’ to the robot, the built-in safety features and a price breakthrough will ensure that in the coming years we will encounter robots everywhere. In the US there are now some 500 sold, in the Netherlands ther is only one Baxter: usually stationed in the robot lab of the Eindhoven University, Fontys, that recently acquired it. 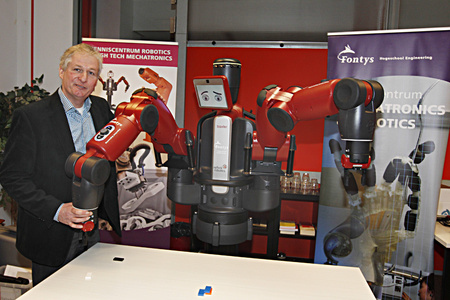 However, the Dutch Baxter is also regularly on tour with Ruud van der Burg of the Foundation ‘The Art of Robotics’, which wants to get the Netherlands to become acquainted with the new collaborative robot co-worker. With a mountain of domino-like stones Van der Burg shows with pleasure how simple Baxter can be programmed. By grabbing one of his arms and leading it to the item, closing the gripper around it and at some distance open it again, Baxter has learnt a task within one minute that he then immediately can repeat it indefinitely. Little cameras in the wrists of the arm make it possible so that the object doesn’t need to be located at exactly the same place each time. “For such a job with other robots you are often programming it for an entire afternoon”, says van der Burg. “Because Baxter can also work with two arms at the same time and push buttons, it is suitable to place products in boxes or machines”, says Van der Burg, who thinks that with such an amount of convenience for €30,000 these robots certainly will start a break through. Not only in production, but also in the care or retail industries. The Dutch Baxter is still largely a case study. There is still plenty to improve on this first robot of his generation. It appears during the demonstration a false light can confuse the recognition of objects. Translated from the original Baxter De Telegraaf Article in Dutch.